Hey folks, my latest WPMUDev blog story posted over the weekend. 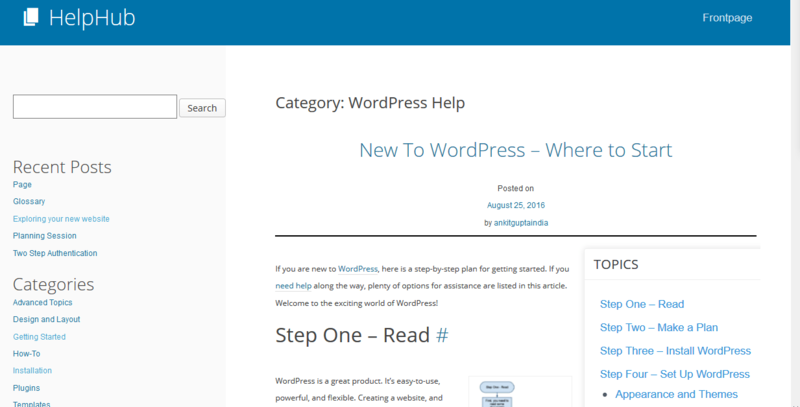 It’s a summary and preview of HelpHub, the upcoming home for WordPress.org’s user documentation site. I really enjoyed writing this, as it combines two of my primary interests, WordPress and technical communication. I also got to poke around both the Documentation team’s area on Make.WordPress, and its Slack channel. Yes, I somehow found that fun. HelpHub has been in the pipeline as a potential replacement for the WordPress Codex since 2015, and the project is (at last) nearing the finish line. The hope is that HelpHub is more like other knowledge bases, a bit more useful to the average WordPress user, and will be easier to search. The team could always use some help, so if you have some technical writing skills (and I know you’re reading this!) and some volunteer time to share, click that Documentation Team link in the second paragraph. I am looking forward to seeing this new documentation site go live in 2018, even if I’ll miss the Codex just a little bit. In the next couple weeks, I’ll have a tutorial in WPMUDev on enabling ElasticSearch on WordPress. ElasticSearch is a faster, more effective search engine than the default WP search. I’m playing with it now. Have a few choice words about the current state of WordPress documentation? What would you like to see in the new HelpHub? Anything I should know about ElasticSearch before I write this story? Feel free to drop a comment here. Try to keep it clean, though!